This article was originally published by the Polish Institute of International Affairs (PISM) on 5 May 2016. Former Baathists—members of the Baath Party that ruled Iraq under Saddam Hussein—including army and security officers, are today the most influential figures in the Islamic State (IS). The opportunism and ideological ambiguity of the former regime elements (FRE) make them ruthless tacticians who use torture and intimidation, but they should also be seen as a potential Achilles heel of the IS. The EU, together with the United States, needs to cooperate on political intelligence in order to examine the possibilities and conditions for weakening IS by bargaining with some of its key members. After the U.S. invasion of Iraq in 2003, the Coalition Provisional Authority embarked on the “de-baathification” of Iraq, a process that aimed to remove senior Baath Party members from the country’s institutions and political system. More than 400,000 members of the defeated Iraqi Armed Forces (IAF) were dismissed and barred from further employment in the government sector, while being allowed to keep their weapons. In the faltering economy, dominated by the public sector, de-baathification meant social exclusion or at least a sudden deprivation of privileges that the elite had become used to over decades. Some of them formed local insurgent forces, and later joined the rising jihadist groups including Al-Qaeda in Iraq, which in 2006 established the Islamic State of Iraq and the Levant (today’s IS). To a large extent this cooperation resulted from discriminatory policies of the Shiah prime minister Nouri al-Maliki (2006–2014), who persecuted former officials and marginalised the entire Sunni population. What united the FRE and the jihadists was the common enemy, the United States and Maliki’s government, rather than ideology. Even during the Faith Campaign (Hussein’s shift towards Islam in the 90s) Baath Party members lived relatively secular lives. Despite different ideological backgrounds, the common enemies and shared desire for power led to a strong synthesis of the jihadists and the ex-Baathists. 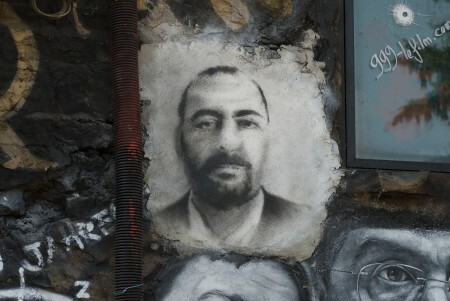 The degree to which this occurred can be illustrated by the fact that Abu Bakr al-Baghdadi, the current leader of IS, was elected to the position in 2010 owing to the support of a former intelligence colonel, Samir al-Khlifawi, who subsequently cleansed the IS management and replenished it with further FRE. Iraqis have the strongest presence in the IS management, both statistically and in terms of expertise. Its leader, al-Baghdadi, is an Iraqi, as are his deputies and most of the governors of the Iraqi and Syrian provinces controlled by the organisation. The vast majority of those Iraqis used to serve either in the army or security services during Hussein’s time, including two of the Islamic State’s senior leaders. Abu al-Turkmani, al-Baghdadi’s deputy for Iraq, was in fact Fadel Abdullah al-Hijali, Hussein’s military intelligence colonel. The deputy for Syria, Abu al-Anbari, was a general in the IAF. Al-Baghdadi does not have a Baathist past himself, but one of his brothers was an officer in the IAF and two of his uncles were in the security services. Out of seven known members of the IS main council (shura), four are ex-Baathists. At least three, but most likely four out of five councils that implement the decisions of the caliph and his deputies are also led by FRE. The military council, crucial for the territorial expansion of the IS, was under full control of the former officers from the beginning. Its first leader, Hajji Bakr, whose real name is Samir al-Khlifawi, was a colonel in Iraqi intelligence services. When he died, Adnan al-Bilawi, IAF’s infantry captain, took over. It is not fully clear who followed after his death, but it was either Adnan al-Sweidawi or Walid al-Alwani. The former was an air force intelligence colonel, and the latter an IAF captain. Out of four known members of the military council, at least three are FRE. According to information acquired in 2014 at least seven out of the 17 top IS leaders whose identities have been established could be FRE. This number would increase to 14 out of 17 if claims that all military council members and remaining governors were FRE could be verified. According to U.S. intelligence sources, they include between 100 and 160 middle and low-ranking officers of the security services and the IAF. It is the FRE who are responsible for the group’s military and administrative achievements. The jihadists may be able to attract foreign recruits through their narrative of a religious war (at the peak there were approximately 37,000 foreign fighters in jihadi organisations in Syria and Iraq), but they lack experience in running a state. What Hussein-era officials brought in was the know-how and ability to reproduce a state with repressive apparatus, multi-level administration and an effective communication system. They provided the “state” part of the Islamic State in all its aspects, from military and tactics, through internal security and repression to the civil service, the taxation system, and foreign policy. Ex-Baathists are also responsible for the financial success of the group. In the 90s, Iraq was under an international embargo that prevented it from exporting oil. It is thanks to the connections and methods of avoiding international restrictions from that period that IS is today capable of earning large sums of money by selling oil on the black market. Their knowledge and experience is also essential in the fight against the regular armies of Iraq and Syria. In operations targeting state facilities, such as prisons, they gave IS fighters precise operational information, such as the identities and shifts of guards, and hidden locations. When they seized cities they knew where to hit first and how to use the IAF’s weaknesses. They knew the locations of secret weapons stores that Hussein kept for militias in case of a war with Iran. The fall of the second biggest Iraqi city, Mosul (the biggest military success of the IS to date) was preceded by a series of simultaneous diversion attacks in remote areas, stretching the Iraqi army to the maximum and leaving it vulnerable. Certain warfare tactics, such as starving besieged cities into submission or attacks in sandstorms, were used by the Iraqi army under Hussein in campaigns against the Kurds or the Marsh Arabs. Today they are in the IS’s tactical portfolio. Member States, in cooperation with the United States, should consider the possibility of disassembling the top structures of the IS, drawing on the opportunism and particularism of Hussein-era officers who are crucial to the survival of the IS. On the one hand, the FRE are key in terms of running the state machinery of the IS, and the two groups’ coexistence on the highest level is almost organic. On the other hand, FRE mindsets, motivations and ideologies seem to be different from the jihadists. Ex-Baathists proved that they would not die for jihad, which is known to have reduced the overall death toll among IS fighters. They introduced discipline and hierarchy that replaced a popular jihadi doctrine, “nizam, la tanzim” (system, not organisation). Their presence in the IS results from opportunism and a desire to reclaim lost positions of power and respect. Aware of the infeasibility of mobilising mass support for their cause, the ex-officers saw their chance in Al-Qaeda’s state-related ambitions (encouraged by the success of the Taliban in Afghanistan). It is possible that some of the FRE in IS could consider an individual compromise entailing quitting the organisation in return for particular benefits. Given their weight, creating internal divisions in this manner, or ridding the IS of its functional backup, could seriously weaken the organisation and accelerate its military defeat. Testing the ground and feasible conditions for such compromise could be partly facilitated by the Gulf States or Iraqi tribal leaders, and their networks of contacts, possibly also in cooperation with the central authorities in Baghdad. Because of the antagonism that has existed since 2005 between the pro-Shiah government in Baghdad and the Sunni population, among whom are the ex-Baathists, as well as the deep financial and personal interconnectedness within the IS, not all FRE will be willing to compromise. Some of them may still have contact with officials from countries once friendly with Iraq, such as Saudi Arabia. One should assume that Russia, in addition to Arab states, may have infiltrated the ranks of the IS, either through citizens fighting in lower ranks under the black flag, or through ex-Baathists using historically good and close relations with the outlawed party. The level of Saudi and Russian cooperation with the EU and U.S. in weakening FRE loyalty to IS will attest to the sincerity of both countries’ anti-jihadist policies. Beforehand, however, the EU Member States should cooperatively examine the FRE presence and profile within the IS. They should identify the possibilities of contact, and the differences between and possible alliances among FRE. This would require a joint action within the EU, especially on the intelligence level. An important step to this end would involve the exchange and analysis of information about diplomatic, military and other contacts in Iraq with European countries from before 2003. Poland, having had particularly close relations with the Hussein-era Iraqi institutions, could take the initiative in such a project, which could also serve as a step toward tightening EU cooperation on counterterrorism. Patrycja Sasnal is Head of the Middle East and North Africa Project at PISM. Tomasz Berg is a researcher at PISM.